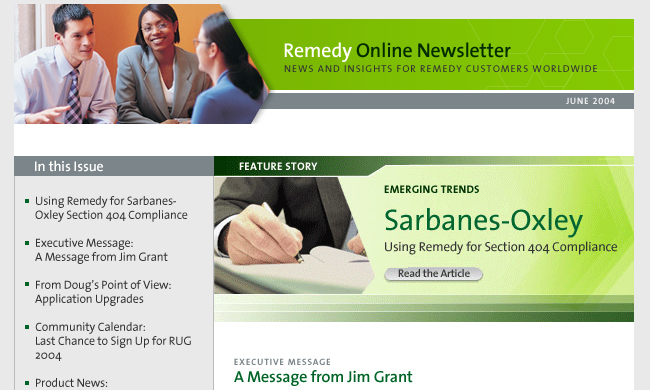 Media Elements designed and built the Remedy newsletter. This newsletter was run off of the clients servers and was built on basic HTML and CSS code. The newsletter was served to the clients through an email campaign link. Business thrives when IT runs smarter, faster and stronger. That’s why the most demanding IT organizations in the world rely on BMC Software across distributed, mainframe, virtual and cloud environments. Recognized as the leader in Business Service Management, BMC offers a comprehensive approach and unified platform that helps IT organizations cut cost, reduce risk and drive business profit. For the four fiscal quarters ended September 30, 2010, BMC revenue was approximately $1.96 billion.